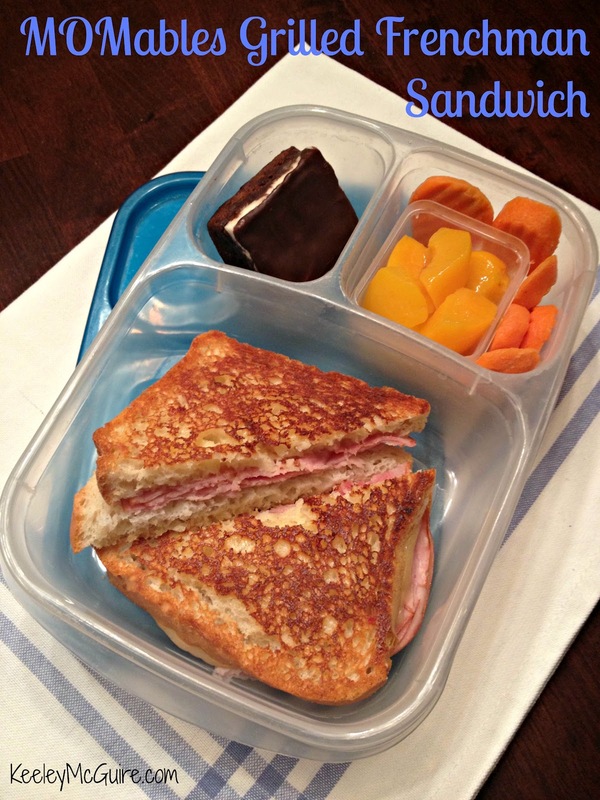 Here's a delicious and simple school lunch that we haven't made in a while. I was so happy to see it on the menu over at MOMables again this week! Depending on your allergies, the lunch can easily be made egg free or dairy free by simply using the bread and cheese that is suitable for your needs. Lunch is a Grilled Frenchman sandwich made on gluten-free bread. Last time, we used brie and ham - it was delicious! This time I grilled it using provalone. Little Miss also has carrot chips and diced peaches top right. Top left is a Peppermint Patty Brownie from Motown Freedom Bakery. Oh my heavens! When we went to metro Detroit this weekend for our FAAN Food Allergy Walk, I knew Katie who is the mastermind behind Motown Freedom Bakery would be there, as she is a part of our amazing No Nuts Moms group of MI. I have heard nothing but wonderful things about her baked goods, especially these Peppermint Patty Brownies. We had to have some! Chocolate brownies, slathered with Peppermint Frosting and coated with Peppermint Chocolate Ganache *drool*! The best part? ALL of Motown Freedom Bakeries good are free of the top 8 most-common allergens: wheat, dairy, egg, soy, peanuts, tree nuts, fish and shellfish. MFB treats are also free of corn, xanthan and guar gums. They also use all natural, premium ingredients. No mixes! And you can be assured there are no artifical ingredients, chemicals, preservatives or food dyes hidden in their treats! They're simply amazing... and delicious. Soon, Motown Freedom Bakery will be offering shipping throughout the country! Grilled sandwiches are my downfall! Thanks for your link ups!